This entry was posted on January 11, 2015 at 5:57 pm and is filed under Biography, Drama, History. You can follow any responses to this entry through the RSS 2.0 feed. You can leave a response, or trackback from your own site. Not seen this: So many have praised it to th skies, bt I reckon it will be – as u say – an interminable slog. Never mind: Happy New Year Mark! It’s incredibly long. It makes its appearance on many critics’ Top 10 lists rather baffling. Good review Mark. Leigh has his own style and believe it or not, it works well here. Not just because Turner has an interesting life, but because he sort of mirrors Leigh’s own life and pleasures. Can’t say I found Turner’s life interesting. Although I will admit that probably had more to do with the narrative as it’s presented here, and not the actual man. This is definitely one of your best reviews here, Mark. Loved it. Now I feel better about the fact that this movie’s not playing nearby me. Thank you! I was pleased with the way this review came out too. I think Mr. Turner will be playing near you in the next couple weeks. It’s still expanding. Very amusing review, although it sounds like the movie could use some of that. I was debating on checking Mr. Turner out actually, but it would appear I made the smart decision to skip it and go for Inherent Vice. I didn’t care for Inherent Vice either but if I had to choose, I’d pick the movie Paul Thomas Anderson directed because at least it was bizarre. Yeah, I think the main thing about the movie for me was the cinematography, which was excellent. Agreed. I’ll even cite the production design, costumes and music for which it happened to get Oscar nominations, 4 total. Yup the “story” was just awful. 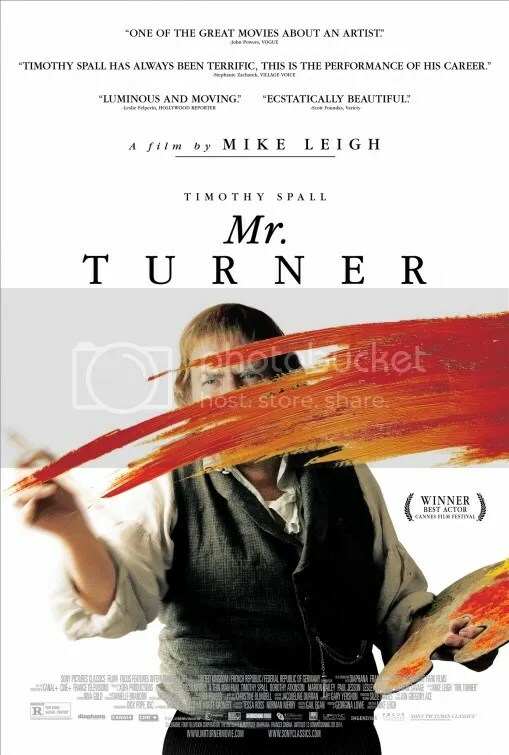 Even from the trailers for Mr. Turner it seemed like Spall would be doing little more than grunting all the time. I think the lack of organization from a plot standpoint in this movie would drive me nuts since story tends to be an important element for me to appreciate a film. “The director’s focus is to wallow in the depths of a boorish clown – a man more inspired to shag his housekeeper (Dorothy Atkinson) than to paint great works of art.” -That part of the movie would bother the heck out of me as well. Even if it was a part of his life, Leigh could have taken some artistic license with it to change it for the better. Dying to see this when it opens this weekend along with a ton of others… Mike leigh is one of the greats!!! Mike Leigh is not for everyone. At $13 million, Secrets & Lies still remains his biggest hit (and that got a Best Picture nomination). Nice review! I didn’t like this much either. It was a well crafted film but I just didn’t get anything out of it. I’m surprised it got 4 Oscar nominations. Granted they were all for technical categories but Interstellar didn’t get a cinematography nomination, Belle didn’t get a nomination for Costumes, and Maleficent didn’t get a production design nomination.